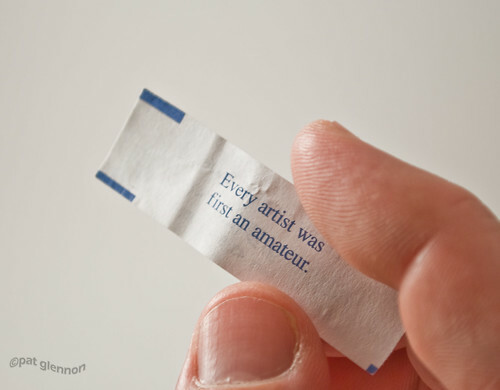 Fortune (243/365 v2.0) – Annoyingly Boring? There is a crew at work that orders out every Friday. This week it was Chinese food. At the end of the night one of my co-workers said she got my fortune. When I first started taking and posting a photo each day back in 2008 I bristled at even calling myself a ‘photographer’. To me the term inferred a level of skill and experience I did not possess. Over the last 20 months I have come to learn that I have become a photographer. Now, with my exhibit set to open at my town’s library, the term ‘artist’ is being bandied about. It’s not one that I am comfortable with. Not yet at least. Perhaps 20 months from now I will grow into the label. Perhaps not. All I know is that I am having a great time and have really enjoyed the journey. Ah, Pat, your modesty is sweet, but get over it! LOL. You ARE an artist, and a very talented one at that. It’s a shame you don’t see yourself that way yet, because there’s lots of us that surely do. Maybe realizing you’ve got an exhibit going on and the craft fair coming up will help you grow into the title of Artist–at least in your own mind, because you’re already there in mine. I know that all in some fashion, and I will get there. And it’s not so much modesty as it is an uncertainty that comes from being new at it all. I know I have talent, I know I can do good things. But there is still wild inconsistency. The amount of support and encouragement I have received from you and others has been overwhelming. I truly appreciate it. Congratulations on the exhibit, artist. .-= Darren´s last blog ..Help Cure JM, or, Happy Birthday, Rhonda =-. Pat, you ARE an artist. Whether you want to be or not, whether you think you are or not, you are. I know how you feel, though. I make quilts, and people are always calling them art. I call them works of love, because I know the imperfections in them, I know what I WANTED to achieve and what I actually made. You sound the same way about your photos. But to me, they are great, you deserve to be called an artist. .-= Karen´s last blog ..What A Great Day! =-. I like the second fortune; “….decide what to be, and go be it.” That’s all it takes! Exciting times — enjoy the ride! .-= christine´s last blog ..The Hansons’ Little Sister =-.